As we’ve noted before, buying tickets last-minute (within 7 days of the event) to a game, concert, or show can often save you money. Today, we took a look at 5 events that take place tomorrow and how prices changed for those events over the last 30 days. Our highlighted events include: Game 5 in the first round of the NBA Playoffs – Hawks at Pacers, Game 1 in the first round of the NHL Playoffs – Sharks at Canucks, Padres at Cubs, Carrie Underwood’s Kansas City show, and The Killers’ Anaheim concert. On April 18, the Pacers had the third cheapest ticket in the first round of the NBA Playoffs; Game 5 was the most expensive in the series. If you waited to buy Pacers Playoff tickets to tomorrow’s Game 5, you paid 72% less than a month ago on April 3 when prices peaked at $213. 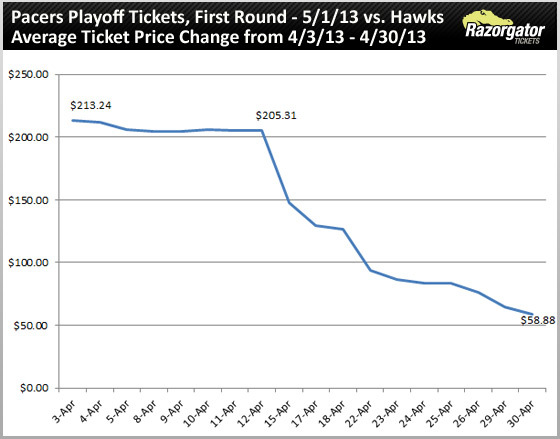 The average Indiana Pacers tickets for Game 5 are down 32% in the last 7 days and reached an all-time low earlier today. Vancouver has won eight of their last nine at home but have yet to get a win against the Sharks this season. Vancouver Canucks Tickets prices have dropped 27% in the last 2 weeks. The average Canucks tickets for tomorrow’s First Round Game 1 are down 21% in the last 7 days, a savings of about $70 per ticket. 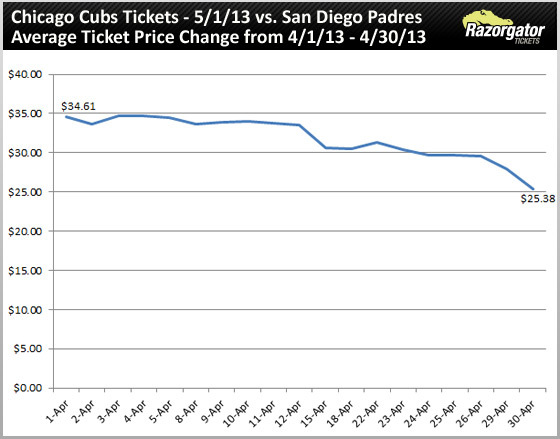 Following the trend of playoff tickets, Chicago Cubs tickets also fell on the secondary market as game day drew near. 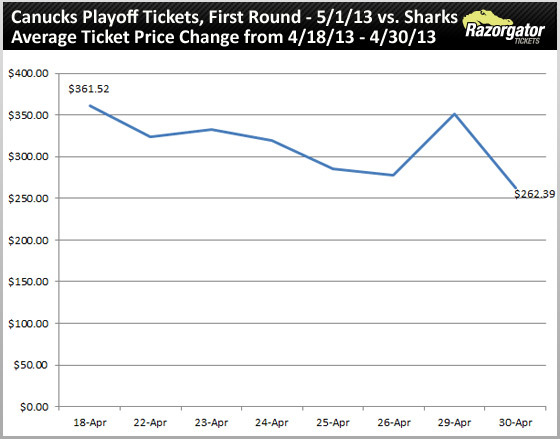 In the last month, tickets were down 27% or $9 on an already cheap ticket. At an average price of $25.38, Cubs tickets today for tomorrow’s game against the Padres, are the cheapest they have been since April 1. Carrie Underwood’s Blown Away Tour has sold out all 2013 dates and will wrap at the end of May. 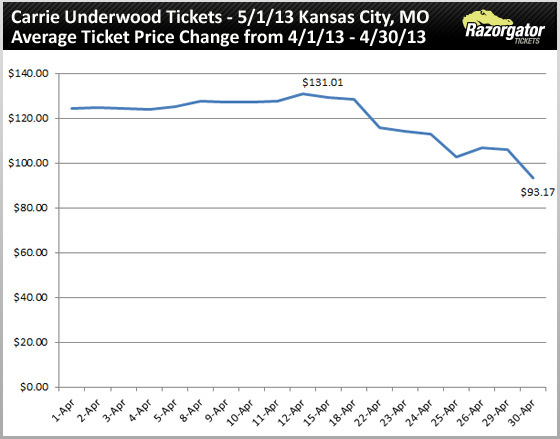 Carrie Underwood tickets peaked April 12 for tomorrow’s Kansas City show and have since dropped 29% on the secondary market. If you bought your tickets to the show at Sprint Center today (opposed to last week), you saved an average of $21 a ticket (-18%). The Killer will stop in Anaheim tomorrow night at the Honda Center. Waiting to purchase your Killers tickets proves beneficial as prices are down 35% in the last month, a savings of about $39 a seat. 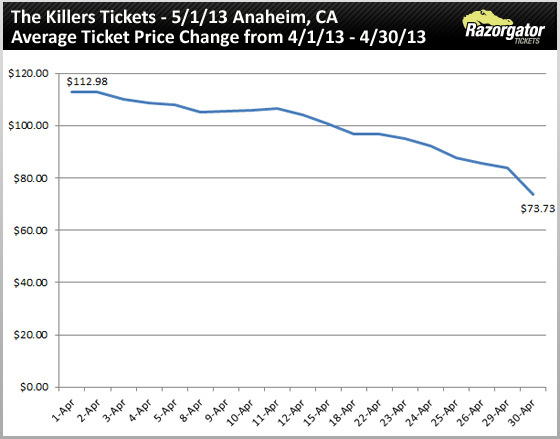 Averaging $73.73 this morning, Killers tickets for tomorrow’s show are the lowest we’ve seen in the last 30 days.